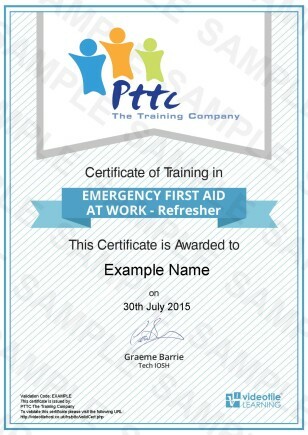 This on-line First Aid at Work Online Refresher Course from PTTC E Learning is essential for anyone who is looking to refresh their First Aid at Work knowledge & skills. Its pointless buying a course & spending time learning, when it wont fit your purpose. So our First Aid at Work online refresher course is 100% fit for purpose and accredited by a major player in the safety industry sector, so you can rest assured you wont be wasting time or money with us! Who Is This First Aid at Work Online Refresher Course For? Our PTTC E Learning Online Emergency First Aid at Work Annual Refresher Training is perfect for your organisation and you or your team to help refresh their existing First Aid at Work Qualification in order to meet the requirements of the Management of Health & Safety at Work Regulation 1999 and the strong recommendations of the Health and Safety Executive (HSE). The HSE strongly recommend that “first-aiders undertake annual refresher training, over half a day, during any three-year certification period. Although not mandatory, this will help qualified in date First Aiders maintain their basic skills and keep up to date with any changes to first-aid procedures”. First Aid is one of those skills that we hopefully don’t have to use that often and if we’re honest wish to never actually practice for real, but that’s in most cases where the problem lies. We don’t use the skill that often and like any skill & theory if we don’t use it not only do we lose confidence, but we can also forget some of the information. And in First Aid situations that could be dangerous for all concerned, so that’s where our online Emergency First Aid at Work Annual Refresher Training is perfect for all certified Emergency First Aid at Work First Aiders. Our Annual Refresher Training is Certified by Royal Society for the Prevention of Accidents, (ROSPA) and takes less than 3 hours to complete and provides the candidate the freedom to learn when and where they can. Our online training portal system is available 24 hours a day and accessible on any device with internet access. Why Do You Need First Aid at Work Online Refresher Course? Where you have ensured that you complied with the relevant first aid legislation by providing trained First Aiders it is then the ongoing task of ensuring that your First Aid team & equipment is fit for purpose and ready for when the worst scenario happens and First Aid is needed. So how do you do that, and also comply with relevant legislation. Simple by meeting the recommendations of the Management of Health & Safety at Work Regulation 1999 where training is periodically refreshed and also the advice of HSE that “first-aiders undertake annual refresher training, over half a day, during any three-year certification period. Although not mandatory, this will help qualified in date First Aiders maintain their basic skills and keep up to date with any changes to first-aid procedures”. This is why our PTTC E Learning Online Emergency First Aid at Work Qualification is perfect for your organisation and you or your team. Our ROSPA accredited e learning course will over less than 3 hours suitably refresh your first team knowledge and test your existing certified First Aide’rs to ensure not only that they meet the legislation and guidance from the HSE, but also that they are ready to deal competently and confidently with any first incident that arises in your workplace. Please Note: This course is not suitable as a stand alone first aid qualification, or to re certify expired First Aid at Work Qualifications, it is designed to help re fresh your first aid teams knowledge and skills, and help your organisation to stay on top of their game and legislation to keep your people safe. Our Fully Accredited and Industry Approved On-line First Aid at Work Online Refresher Course is aimed at anyone that hold the position of first aider or appointed person within their day to day duties at work. This first module will introduce you to the course and its structure, it will then explain what is meant by the term First Aid. This module will explain & demonstrate the basics of the recovery position, all important barriers, and the ABCDs. Within this module you will learn about the importance & practical steps of CPR & the huge benefits of AEDs. This module will explain about chocking and how to safely deal with incidents that involve choking. Managing bleeding is such an important skill, and this module we will explain & demonstrate current best practices to mange and stop bleeding. Some spinal injuries can cause catastrophic or near fatal consequences if not managed correctly, so this module will explain & demonstrate current best practice and safe management of a casualty. This module will take you though the types of breaks you may come across, and how best to deal with them. Possibly one of the most common injuries a first aider will come across and possibly one of the most complex as often you cant see what is going on. So this module will explain current guidance and best practice of safely dealing with head injuries. Sprains & Strains are very common & in some case very similar, so in this module we discuss identification and treatment guidance. Incidents & accidents can be stressful and hectic situations, so this module will walk you through how to better deal with such situations and the importance of good record keeping & reporting. This module will highlight the best forms of treatment & care for burns and scalds. Electric shock can cause fatal in some cases, so in this module we will take you through not only safety precautions but also the most effective treatment and care of those injured by electric shock. In this module we will discuss and demonstrate the safest and correct treatment & care when dealing with eye injuries. Within this module we will re fresh your skills & knowledge around identification, treatment & care of Epilepsy, Anaphylaxis and Diabetes. Heart Attacks & Strokes are on the increase & if not identified, treated and cared for promptly and effectively can be fatal. So this final module will refresh your knowledge and skills around this specific area. 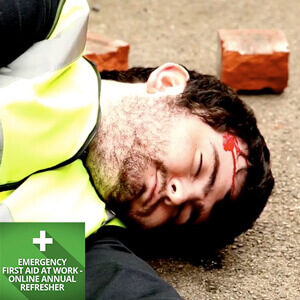 This Online Emergency First Aid at Work Annual Refresher Training meets the strong recommendations of the HSE and the Management of Health & Safety at Work Regulation 1999 to annually refresh First Aid at Work Qualification. Our training also provides you and your team with a modern cost effective refresher training solution that can provide great results in refreshing knowledge, skills and confidence in this subject area for a fraction of the price of other courses. Training takes less than 3 hours to complete, and once you or your team members have successfully completed the course you can simply download the certificate. This Course is certified by ROSPA (Royal Society for the Prevention of Accidents). If you are not sure if our Online First Aid at Work Online Refresher Course is the right course for you, or if you’re a bit dubious as to the quality of our training course will be what you’re expecting why not try one module of the course of your choice inc the assessment FOR FREE . This will give you a free chance to experience hands on our on-line learning environment. To get a Free Trial Just click on the ‘Free Trial Logo & follow the video instructions to access the online learning area. Once you have trialled the module you will then be given the option to purchase & continue with your course! Our On-Line First Aid at Work Refresher has 150 minutes of video to watch, and 64 questions to answer. We estimate that the course should take you no more than 3 hours to complete. If you want to do it over a number of days then that’s fine, the system will remember where you left off and you can go back to it at exactly that point. The simple answer to this is yes, our First Aid at Work Refresher is, the course is Certified and accredited by ROSPA (Royal Society for the Prevention of Accidents) so you can rest assured that this course will meet your needs if you are looking for a competent introduction to the First Aid at Work Refresher. There no problem with that, with our system you get 3 chances as standard to take and successfully pass the First Aid at Work Refresher. If you are still unsuccessful at that stage, then just drop us a line and we will provide you with 3 further attempts free of charge. Once you have watched the 33 video lessons and successfully answered the 64 questions, gaining a 75% average pass rate you can then simply download and print off your Certified ROSPA First Aid at Work Refresher certificate. This type of training gives lifelong knowledge & skill, however there a legal requirement to refresh the First Aid at Work Refresher. It is recommended by the Health & Safety Executive that this training is refreshed at least every 12 months to maintain your skills, however like any skill or knowledge we learn memories fade over time especially if we don’t use those skills. So, you can always come back again if you wanted to and refresh your skills and update your knowledge by purchasing and completing the course again. That’s easy as well. You can pay for your First Aid at Work Refresher online with your credit card, debit card, or PayPal. However sadly we no longer accept cheques, sheep, horses, or gold.